How can you get the new IHG Rewards Club Spire tier? Which sorts of IHG Rewards Club points count for status, and which don’t? It’s January, and your hotel status points will have reset to zero. Qualification, or requalification, for a higher status tier feels a long way away. Luckily, for IHG Rewards Club members there are ways of earning status points without staying in their hotels. IHG Rewards Club, the loyalty scheme for InterContinental, Holiday Inn, Crowne Plaza, Indigo etc, status is not hugely rewarding. The benefits are very modest – almost nothing is guaranteed – and you certainly won’t get anything as crazy as free breakfast or guaranteed club lounge access. The programme is for people who like earning lots of points because, with their regular promos, earning and spending IHG Rewards Club points is very easy. The trade off is that the hotels do not invest much in status benefits. That said, most European hotels now offer status members some bonus points (500-600 at the mid and upper scale hotels) or a free drink or some other benefit. Taking the free drink, assuming that you are not on an expense account, does get you a few £ of value. From Spring 2019 the Ambassador loyalty programme, which covers InterContinental hotels, will also give Platinum status in IHG Rewards Club. See this HFP article for details. There is a $200 fee for Ambassador. If you want top tier Spire Elite status, however, you need to earn it. Spire Elite will require you to earn 75,000 base points or stay 75 nights in a calendar year. Spire Elite doesn’t have a lot of benefits over Platinum. 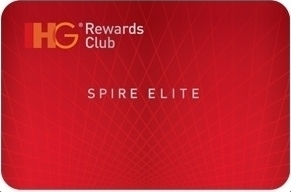 What you do get, though, is 25,000 bonus IHG Rewards Club points as soon as you reach or requalify for Spire Elite. If you are close to the threshold to qualify, the lure of these 25,000 points should make you put some effort into making it. You will also get a 100% points bonus on every stay compared to a 50% bonus as a Platinum member. You earn 10 base points per $1 on your bill at IHG hotels, as long as your room was booked directly (not via Expedia etc) and was not heavily discounted (a rule of thumb is more than 30% from the Best Available Rate). Some hotels offer room rates which offer bonus points if you are prepared to spend more. These bonuses can be as high as 5,000 points per night or more. Sometimes it works out cheaper than buying points directly, sometimes it doesn’t. However, as these points DO count as base points, these rates are now more attractive if you are chasing status. You can find hotels which offer these rates here. Note that this must be advertised on ihg.com as a ‘Bonus Points’ package. If you book any other package which just happens to come with additional points, these will not count for status. Whilst sign up bonuses no longer count, points from your day to day spend DO qualify. A heavy credit card spender could achieve the new top tier by spending £37,500 on the IHG Rewards Club Premium Mastercard without setting foot in a hotel. I managed to retain my Spire Elite status for 2018 primarily through credit card spend. IHG appears to have dropped its car rental partners. I can’t be 100% sure about this, because – whilst the relevant pages are no longer available via the IHG website – you can still bring them up via a Google search. If they are still going, previous feedback from HFP readers is that they do count for status. I wrote about Travelling Connect here. You earn points in various airline and hotel programmes when your mobile phone is used on specific networks outside the UK. It is no-brainer to register your mobile for this if you travel. Travelling Connect would prefer you to manually change your mobile network when abroad in order to pick one that earns points – I don’t do this, but if my phone just happens to connect to a TC partner then I get some points for absolutely no work whatsoever. I’d be grateful to hear from any readers who can confirm, or not, that recent transactions from Travelling Connect counted for status. IHG has a partnership with OpenTable for restaurant bookings which I wrote about here. In the majority of cases, you earn 150 points per booking, boosted to 500 on your first booking. These points count for elite status. Note that, in my experience, the IHG booking page has less availability than the main OpenTable site. Gold members receive a 10% bonus on base points. Platinum members receive a 50% bonus. The top tier Spire Elite members receive a 100% bonus. These are not treated as base points. Gold, Platinum and Spire members in Europe and some other regions are offered a choice of a free drink or snack or a few hundred points (500 at a Holiday Inn) at check-in. If you take the points, they do not count for status. Any bonus you get for signing up to the IHG Rewards Club credit card will no longer be treated as base points. This is a shame as the UK Premium card offers 20,000 points for signing up, whilst the free card offers 10,000 points. Your points from day-to-spending DO count, however, which means that putting £37,500 through the £99 credit card gets you Spire Elite without having to go near a hotel. If IHG sends you a code for 1,000 bonus points on your next stay, or if they offer a global points promotion, those points are not treated as base points. These definitely don’t count towards status. That would be too easy! As you can see from this page of the Virgin Atlantic website, you can transfer your Flying Club miles – minimum 10,000 – into IHG Rewards Club on a 1:1 basis. Now that the points no longer count towards status, this is a bad deal as I only value an IHG point at 0.4p. You can also transfer points from Finnair into IHG Rewards Club – see here. There are very few reports from people who have done this, but the last one I saw said that it did not count for status. I wrote about points.com here. It is a website which allows you to transfer points from some airline and hotel programmes into some other airline and hotel programmes. I don’t mention it much because neither Avios or Virgin Atlantic are partners. IHG is a partner. Two years ago I converted some unwanted Virgin America miles into 7,500 IHG points. These did not count as base points. As of February 2017, transfers from the e-rewards market research scheme (invitation only, you need to be opted in to marketing email from IHG partners to get an invite) no longer count towards status. You can now transfer 'pending' Clubcard points to Avios or Virgin - no more quarterly waits! Have to say while Spire might not be worth much the better selection of drinks on the two drinks vouchers I normally get is usually a good rebate on the cost of a single night. Also always get the voucher as sometimes you’ll get the points anyway. Crowne plazas also offer lounge access for spire members as well though free breakfast would be nice as it must be the only top tier status to not offer this. *some Crowne Plazas 😉 Wish it was a universal benefit, I might book to stay at them more in that case! OT. Just looked at the price for Hilton hotel in Tokyo for May. I thought stay for 5 nights will only pay for 4 nights. However the total cost for 5 nights is work out exactly the same cost per night, for 4 nights. Am I missing anything? Either a) you have no Hilton status or b) you are being quoted for Premium redemptions which don’t count for 5-4-4. Hilton is currently have a sales. Is the sales price count as premium redemption? No, Premium redemptions are points bookings marked as ‘Premium’. remember this is only for using points I think and not paying with money only. The same deval announced at the start of the month and then delayed slightly? Ah. Rob has pointed out to me that he covered this some weeks ago and that the devaluation is not really that bad. This is just delayed coverage of what we already knew about – see FT thread confirming this too. Award Wallet always quite slow in covering these sort of things.